With its constant level lake, 21 miles of shoreline, and Texas Hill Country views, Lake LBJ is known as one of the top lake vacation rental destinations in Texas! On this page you will find over 20 of the top Lake LBJ vacation rentals in The Highland Lakes. Besides boating, fishing and swimming on Lake LBJ, you are a short drive from Austin, day trips to Fredericksburg, New Braunfels (Schlitterbahn), Inks Lake State Park, Longhorn Caverns State Park and only 1.5 hours from San Antonio. We invite you to contact one of our friendly vacation planners who will help you find just the right vacation rental in just the right spot to take advantage of everything Lake LBJ and The Texas Hill Country has to offer. 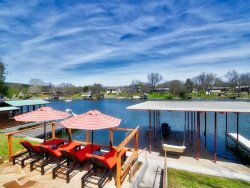 Two or Three bedroom Lake LBJ rental homes ideal for small groups or couples, located in Kingsland or Burnet, on the Llano or Colorado arms of Lake LBJ. Clearwater Harbor / Clearwater Landing located within The Legends Golf Course community offers resort style amenities. Our entire selection of lake home rentals are situated on private, prime, open waterfront. Our largest selection of homes are 4-6 bedroom, which is the most desirable for families and groups. Guaranteed lakeside fun is offered, with each home adding its own unique amenities - whether its a sandy, private beach on shallow water, a sandy beach with shallow to deep water, private swimming pool and a V-drive boat lift that supports 8,000 lbs, large grassy yard with shade trees for reunion picnics...the list goes on. If location is an important factor, we have homes on the Upper and Lower Colorado Arm, Llano Arm, Main Body (where Llano and Colorado Arms meet), Granite Shoals and Horseshoe Bay - all on open waterfront and 5 star coves. Please call us or review our property listings here, to find which home will suit your needs. Front Desk Vacation Rentals understands that many families are on a budget. It is therefore important to provide well-maintained and managed lake homes with guest services, that are also affordable. All of our lake homes have desirable amenities such as docks and boat lifts, pool tables, cable/satellite, internet service, and more. With our service and management, each lake home is well-maintained, clean, and stocked with fresh linens, bath towels, basic supplies and equipped kitchens. Guests of Front Desk Vacation Rentals can always call in case of an emergency (we offer prompt service for AC/Heat, plumbing, electrical, boat, jet ski or lift issues, help with home amenities, replacement of items such as coffee maker, toaster, blender, for information or recommendations, driving directions, and more. We are local and just minutes away from all of our lake homes. All of our Lake LBJ Lake Homes provide vacation rental necessities such as fully equipped kitchens, modern appliances and electronics, comfortable beds, tidy, well maintained and inviting surroundings, and prime waterfront for boating, swimming and fishing. A Luxury Lake LBJ Rental however provides additional amenities and features that enhance your lake home experience, such as a private swimming pool or jacuzzi, game room with pool table, ping pong, foosball and/or arcade games, WIFI, Smart TVs, water trampoline, kayak, canoe and/or paddle boat, frisbee golf, volleyball, basketball, outdoor kitchen and living area, and more.